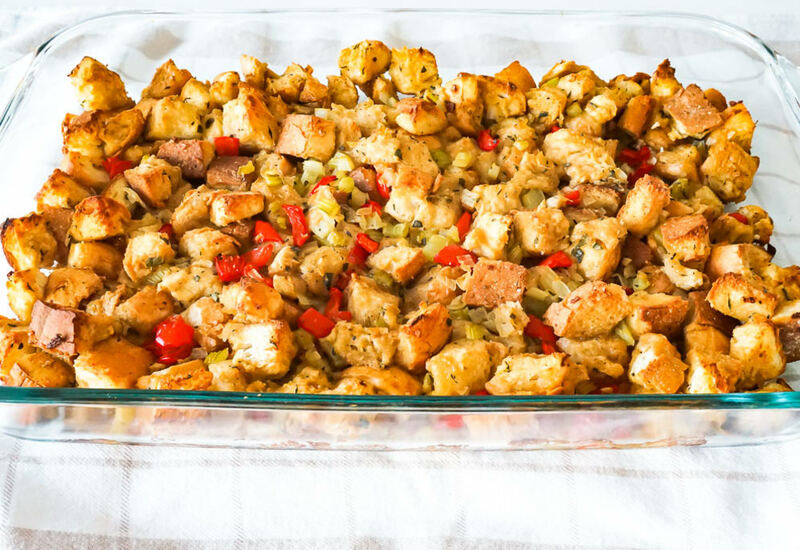 Let's be honest, stuffing is everyone's favorite Thanksgiving dish. It's hard to beat the combination of toasted bread, aromatic seasonings and the tender, chewy interior and crispy crust. This classic recipe uses onion, celery, sweet pepper, garlic and a mixture of fresh herbs to flavor the bread. Since the ingredients are relatively simple, be sure to use homemade or good-quality chicken stock. If you forgot to let your bread dry out overnight, spread the cubes on a baking sheet and preheat the oven to 200°. Bake the bread until toasted and very dry, one to two hours. You can easily make this a vegetarian stuffing by using vegetable stock instead of chicken. Looking for a way to make it more hearty? Stir in a pound of cooked, ground pork or chicken Italian sausage with the bread mixture and bake as directed. Per Serving: 76 calories; 4g fat; 7.7g carbohydrates; 3g protein; 10mg cholesterol; 209mg sodium. I've always only ever considered making stuffing for Thanksgiving, but this recipe is also perfect for Christmas as well. I love the bell peppers and celery, it gives this dish really good flavor. The rosemary, sage, and time seasonings are also incredible together. I can't wait to serve this with my roasted chicken! I love this dressing! The rustic bread works so perfectly in this dish, soaks up all the flavor nicely, and doesn't get soggy. If you're entertaining this holiday season, you've got to try this! I usually make my dressing with cornbread, but I really liked the use of the dry bread cubes in this recipe. The onion, bell pepper, and celery gave it almost a Cajun flavor. This was really delicious and I look forward to making it again next year.